So far we have described each of the Tk widgets but have not mentioned how they are arranged to be displayed. Tk separates the creating of widgets from the way they are arranged for display. The “geometry” of the display is handled by a “geometry manager”. A geometry manager is handed the set of widgets to display with instructions on their layout. The layout instructions are particular to each geometry manager. Tk comes with three distinct geometry managers: grid, place, and pack. As might be expected the grid geometry manager is useful for creating tables of widgets, for example, a table of buttons. The place geometry manager simply gives each widget an X and Y coordinate and places them at that coordinate in their particular parent window. The pack geometry manager places widgets according to constraints, like “these three button widgets should be packed together from the left in their parent widget, and should resize with the parent”. Each container widget (the master) has a geometry manager associated with it, which tells the container how to display its sub-widgets (slaves) inside it. A single master has one and only one kind of geometry manager associated with it, but each master can have a different kind. 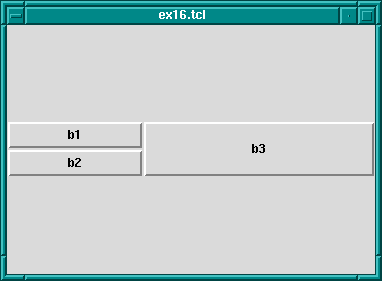 For example, a frame widget can use the packer to pack other frames inside it. One of the slave frames could use the grid manager to display buttons inside it itself, while another slave frame could use the packer to pack labels inside it itself. The problem is how to display widgets. For example, there is an empty frame widget inside which a bunch of other widgets will be displayed. The pack geometry manager’s solution to this problem is to successively pack widgets into the empty space left in the container widget. The container widget is the master widget, and the widgets packed into it are its slaves. The slaves are packed in a sequence: the packing order. What the packer does is to take the next slave to be packed. It allocates an area for the slave to be packed into from the remaining space in the master. Which part of the space is allocated depends on instructions to the packer. 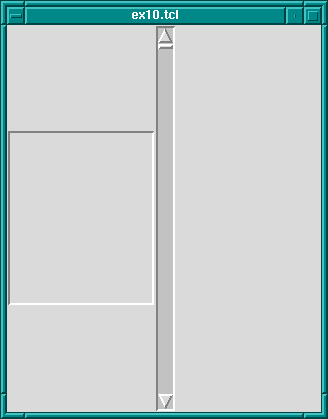 When the size of the space has been determined, this is sliced off the free space, and allocated to the widget that is displayed in it. Then the remaining space is available to subsequent slaves. At any one time the space left for packing is a rectangle. If the widget is too small to use up a whole slice from the length or breadth of the free rectangle, then still a whole slice is allocated so that the free space is always rectangular. It can be tricky to get the packing instructions right to get the desired finished effect, but a large number of arrangements of widgets is possible using the packer. which produces a display of the three buttons, one on top of the other, button .b1 on the top, and button .b3 on the bottom. .b2 config -text "hello world"
then we see that the window grows to fit the middle button, but the other two buttons stay their original size. will pack starting at the left hand side of the window. The result of this is that the buttons are formed in a horizontal row with the wider button, .b2, in the middle. which adds 10 pixels of space to either side of the button widgets. This has the effect of leaving 10 pixels at the left side of button .b1, 20 pixels between buttons .b1 and .b2, 20 pixels between buttons .b2 and .b3, and finally 10 pixels on the right side of button .b3. instead of spacing out the widgets, will increase their dimensions by 10 pixels in each direction. Remember that space is allocated to a widget from the currently available space left in the master widget by cutting off a complete slice from that space. It is often the case that the slice is bigger that the widget to be displayed in it. There are further options for allowing a widget to fill the whole slice allocated to it. This is done through the -fill option, which can have one of four values: none for no filling (default), x to fill horizontally only, y to fill vertically only, and both to fill both horizontally and vertically at the same time. button .b2 -text "hello world"
How does this work? The width of the toplevel windows is dictated by button .b2 because it has the widest text. Because the three buttons are packed from top to bottom, the slices of space allocated to them are cut progressively straight along the top of the remaining space. i.e. each widget gets a horizontal slice of space the same width cut from the top-level widget. Only the wide button .b2 would normally fit the whole width of its slice. But by allowing the other two widgets to fill horizontally, they will also take up the whole width of their slices. The result: 3 buttons stacked on top of each other, each with the same width, although the texts they display are not the same length. Now the display looks like a normal listbox with a scrollbar. Why does this work? 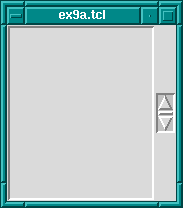 They are packed from the left, so first a large vertical slice of the master is given to the listbox, then a thin vertical slice is given to the scrollbar. The scrollbar has a small default width and height and so it does not fill the vertical space of its slice. But filling in the vertical direction (through the pack .s -fill y command) allows it to fill its space, and so it adjusts to the height of the listbox. The fill packing option specifies whether the widget should fill space left over in its slice of space. A further option to take into account is what happens when the space allocated to the master widget is much greater than the that used by its slaves. This is not usually a problem initially because the master container widget is sized to shrink-wrap around the space used by its slaves. If the container is subsequently resized, however, to a much larger size, then there is a question as to what should happen to the slave widgets. 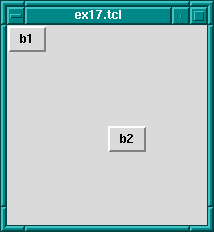 A common example of resizing a container widget is the resizing of a top-level window widget. The default behavior of the packer is not to change the size or arrangement of the slave widgets. There is an option though through the expand option to cause the slices of space allocated to slaves to expand to fill the newly available space in the master. expand can have one of two values: 0 for no expansion, and 1 for expansion. Initially this looks good, but now resize the window to a much bigger size. You will find that the listbox stays the same size and that empty space appears at the top and bottom of it, and that the scrollbar resizes in the vertical. It is now not so nice. We can fix part of the problem by having the listbox expand to fill the extra space generated by resizing the window. 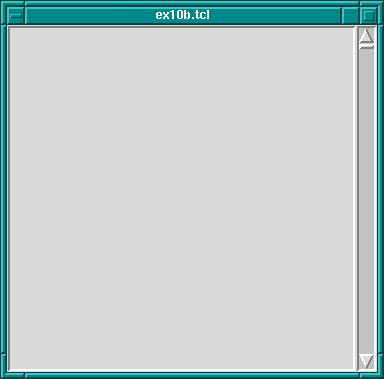 The problem now is that expand just expands the space allocated to the listbox, it does not stretch the listbox itself. To achieve that we need to apply the fill option to the listbox too. Now whichever way the top-level window is resized, the listbox-scrollbar combination should look good. Now resize the window. You will see that the buttons resize to fill the width of the window, each taking an equal third of the width. Please note: the best way to get the hang of the packer is to play with it. Often the results are not what you expect, especially when it comes to fill and expand options. When you have created a display that looks pleasing, always try resizing the window to see if it still looks pleasing, or whether some of your fill and expand options need revising. There is an option to change how a slave is displayed if its allocated space is larger than itself. Normally it will be displayed centered. That can be changed by anchoring it with the -anchor option. The option takes a compass direction as its argument: n, s, e, w, nw, ne, sw, se, or c (for center). Each button is anchored at the top of its slice and so in this case is displayed at the top of the window. will change the positions of .b2 and .b3 in our examples. The grid geometry manager is useful for arranging widgets in grids or tables. A grid has a number of rows and columns and a widget can occupy one of more adjacent rows and columns. this will display button .b1 above button .b2. Button .b3 will be displayed in the next column and it will take up two rows. which says stick in the north and south directions (top and bottom). This results in .b3 taking up two rows and filling them. which says that the weight of column 0 for master . (the root window) is 1 and the weight of column 1 is 2. Since column 1 has more weight than column 0 it gets proportionately more space in the master. 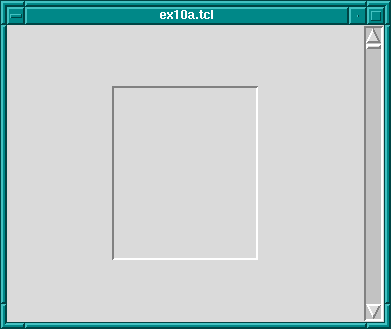 Now resize the window to various sizes and we will see that button .b3 has twice the width of buttons .b1 and .b2. 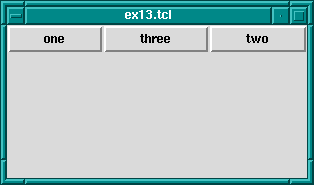 The same kind of thing can be specified for each row too via the grid rowconfigure command. For other options and a full explanation of the grid manager see the manual. will place the buttons .b1, .b2, and .b3 along a diagonal 100 pixels apart in both the x and y directions. Heights and widths can be given in absolute sizes, or relative to the size of the master in which case they are specified as a floating point proportion of the master; 0.0 being no size and 1.0 being the size of the master. x and y coordinates can also be specified in a relative way, also as a floating point number. For example, a relative y coordinate of 0.0 refers to the top edge of the master, while 1.0 refers to the bottom edge. If both relative and absolute x and y values are specified, then they are summed. Through this system the placer allows widgets to be placed on a kind of rubber sheet. If all the coordinates are specified in relative terms, as the master is resized, then so will the slaves move to their new relative positions.